The way public school funding works in Ohio isn't hard to understand. It really isn't. But folks find it easier to just believe whatever misinformation they hear from a neighbor or friend than doing the research themselves. And frankly, few school districts or elected representatives are trying to educate their constituents about school funding either, so misinformation continues to propagate, and gets reinforced in its repetition. One of those is about the constitutionality of using property taxes to fund our public schools in Ohio. Most people believe the Ohio Supreme Court ruled that property taxes may not be used to fund schools. We saw that mistaken belief expressed yet again in a Letter to the Editor published by The Columbus Dispatch today. The Ohio Supreme Court never said that property taxes were an unconstitutional way to fund our schools. 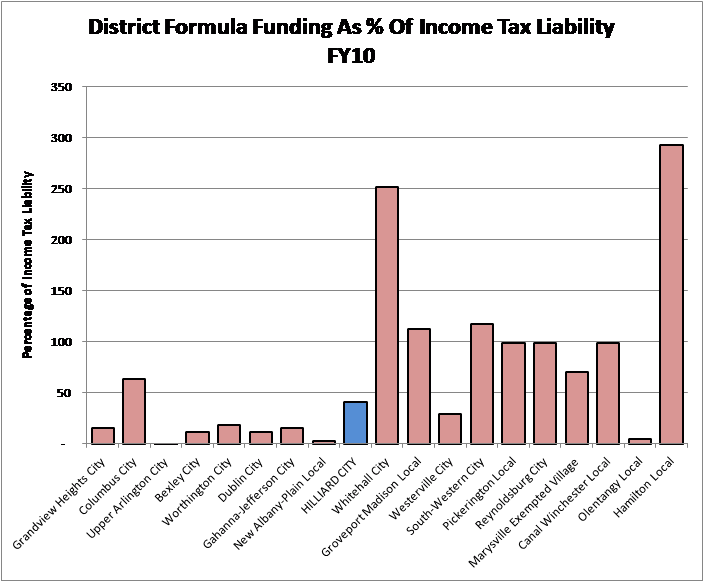 What they said was that the funding system used at the time the lawsuit was filed (DeRolph v. State of Ohio), granted insufficient state funding to some districts, which caused those districts to have an "overreliance on property taxes." The funding system the Supreme Court made this ruling about is gone. It was replaced first by the "Evidence Based Model" championed by Governor Strickland, and then the temporary funding plan implemented by Governor Kasich. So the Court's ruling in DeRolph is moot. The most we can say is that the constitutionality of the current system is untested in court. 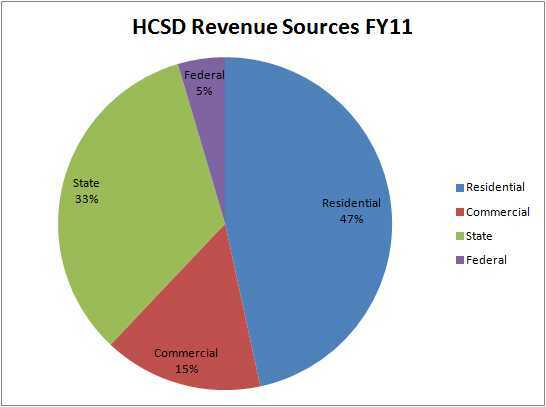 Residential Property Taxes: This is our primary funding source, providing 47% of our total funding, or $5,200 per student per year. It changes due to two primary things: a) a new operating levy is passed by the voters; and, b) when new homes are built in the school district. Every dollar of property tax we pay stays in our school district. Let's correct another common misconception: EVERY residential property owner in our school district pays EXACTLY THE SAME property tax rate. Our property taxes fund many agencies, and the agencies which appear on our individual tax bills depends on which municipality one lives in. Our school district includes all of the City of Hilliard, pieces of Dublin and Columbus, and all or some of several townships. Each may impose their own property taxes, making us have differing total tax rates. But we all pay the same school property tax rate, and it all comes to Hilliard City Schools. Commercial Property Taxes: These are property taxes paid by the commercial property owners in our school district. They don't get to vote on the levies we put on the ballot (unless the commercial landowners are also residents of the district), but they pay the same property taxes as residential landowners nonetheless - unless a property tax abatement is granted by whichever municipality the business lies in. It's a bizarre thing: a city may waive up to 75% of the property taxes for a business without the approval of the school district. But it's not their revenue to give away in the first place! Nonetheless, a city and school district acting in partnership will often decide that an abatement is a good thing. Such a decision was made at our last School Board meeting, when we agreed with the City of Columbus to grant a ten-year 75% abatement deal to Boehringer Ingelheim Roxanne Labs, who is competing internally for the opportunity to expand their operations. To not grant this abatement would mean losing the opportunity to collect any new revenue. It's a reasonable deal for an important community partner that we'd all like to see grow and be successful. As is the case with Residential Property Taxes, every dime of the Commercial Property Taxes collected in our school district stays here. Today it is 15% of our funding, or about $1,700 per student per year. When our family came to the school district thirty years ago, the total Commercial Property Taxes was about equal the total Residential Property Taxes. This commercial percentage has gotten smaller not because there are fewer businesses now than then, but rather because there are thousands more houses, and of course thousands more kids to educate. The problem here is that the incremental property tax revenue generated by the typical new single-family home is a fraction of the incremental cost to educate the school age kids who will live in that new house. That's why we need lots more commercial property development in our school district. Otherwise the school funding burden created by new homes has to be funded with new levies - meaning more taxes on the rest of us. Federal Grants: As you can see, this is a relatively minor revenue source, consisting mostly of things like our Title 1 funding to help disadvantaged children. It amounts to about $500 per student per year. We got a nice Federal stimulus gift of a few $million for a couple of years, and that's not reflected in this percentage, but it was one-time money and is long gone. State Grants: This is our second largest source of funding, representing 33% of our revenue stream, or about $3,700 per student per year. The bulk of this is the so-called Foundation Aid, the primary state funding stream. Foundation Aid increases with the number of students, and decreases with the perceived affluence of a school district, as measured by aggregate property values, whether residential or commercial. 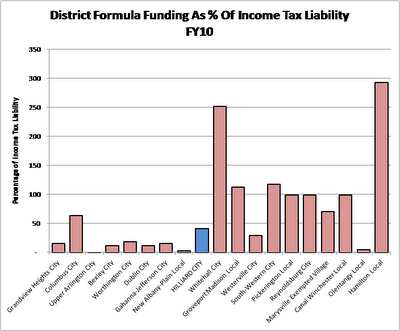 The Ohio Association for Equity and Adequacy of School Funding - representing mostly lower income school districts. This was the group that file the DeRolph case. In the past ten years, our Governors and the General Assembly have tried three different approaches to determining how much funding each of the 614 local school districts should receive from the State. None of them have satisfied everyone, and we still don't know what the Kasich administration is going to propose as a replacement to temporary funding mechanism now in place. In our case, we get back 41¢ for each $1 we pay in Ohio Income Tax. Three area school districts, Pickerington, Reynoldsburg and Canal Winchester get back every penny they pay in Ohio Income Taxes. Two districts, Whitehall and Hamilton get back multiples of what they pay. The assumption made down at the Statehouse is that districts like ours have the capacity to pay an ever-increasing fraction of the cost to run our schools. That's the reason they thought it was okay to accelerate the phase-out of our Personal Property Tax reimbursements, which is one of the primary reasons we put a 5.9 mill levy on the ballot in November. So that's it - school funding in a nutshell. I'm happy to answer your questions. We'll discuss spending (again) in an upcoming post. All data used in this article were taken from the 2010 CUPP Report, published by the Ohio Department of Education. One of the top news stories this week has been the wreck of the the cruise ship Costa Concordia, which struck submerged rocks off the coast of Italy and sank. Fortunately, nearly all the passengers and crew were able to reach safety. It sounds like the one right thing the Captain did - before he cowardly scampered overboard to safety, leaving his passengers and crew behind - was to quickly steer the ship to shallower waters so that it wouldn't fully capsize, like in the movie The Poseidon Adventure. This action undoubtedly saved many lives. But this tragedy was set up by decisions he made a long time before the hull was torn open. I've had the opportunity to stand bridge watches on one of our Navy's ships of the line. I never saw the Captain just 'wing it' when sailing close to land, or in a narrow channel. Before leaving or entering port, or just sailing near a coast, the Captain and Navigator develop a maneuvering plan which includes waypoints and course bearings, and in doing so they pay close attention to all the depths and obstacles marked on the official nautical maps. Once underway, observations are taken continuously via radar, sonar depth finders, and visual means - even with the existence of things like GPS. Every few minutes, the actual position of the ship is plotted on official charts, which become part of the legal record of the passage. Other than maneuvers which might required to avoid other vessels, there is no deviation from the plan. You don't kid around with this navigation stuff, whether the ship is a naval vessel, an oil tanker, or a cruise ship. Mistakes can be extraordinarily deadly and expensive. Big ships can be surprising fast. Not only are our nuclear aircraft carriers the largest ships in the fleet, they're also the fastest. Although you won't find official confirmation, in the right sea conditions, carriers are said to be able to go over 40kts (about 45mph) - think a thousand foot long, 100,000 ton ski boat. Carriers need to be fast because the amount of weapons load an aircraft can carry when being catapulted off the flight deck is directly related to the amount of airspeed which can be generated over their wings, which is the sum of the actual windspeed while pointed into the wind, the speed of the carrier, and the terminal speed of the catapult. But you had better not want to change course very quickly if you're sailing a carrier at flank speed. And if someone falls overboard, the carrier doesn't even try to go back and rescue the poor soul. It takes many miles of turning and a good deal of time for a carrier to return to a spot it has passed, so it's much quicker to dispatch a helicopter or one of the other ships always sailing with a carrier. The captain of the Costa Concordia didn't think his maneuvers through very well. He clearly picked a track on which no large cruise ship had ever before sailed, and he was reportedly doing it to show off to the folks on the island they were passing. Apparently lots of cruise ship captains do this in this part of the world. Maybe this captain wanted to be the hottest of the hot-dog captains of the Mediterranean cruise industry, so he took a gamble. But even if they had seen those rocks from a mile away, it would have been too late to avoid a collision. The ship is too big and too fast. Inertia wins every time. Our school district is like one of these big cruise ships. There has been a huge investment of talent and treasure to get us where we are. The quality of the experience our kids will have going forward will be dictated by the quality of decisions and plans made largely out of the view of the students and parents. But once execution begins, and the kids roll into the classrooms, things happen fast, and changing course can be very difficult. There is such a thing as organizational inertia as well. The executive team of our district produces a few key planning documents which are used to lay out the course. The longest-range plan is the 2020 program, initiated in 2006 by Superintendent Dale McVey. It sets the general course for the school district, and gives guidance for planning and action all the way from the central office to the classroom. It should be read, reread and adjusted as necessary to make sure all stakeholders agree on the course and speed of our collective journey. I very much enjoy reading naval history, especially of the World War II era. I'm currently reading Neptune's Inferno by James Hornfischer, which tells the story of the battles at Guadalcanal in the south Pacific. It never occurred to me before reading this that even with the sinking of many battleships at Pearl Harbor, the US Navy still had a fair number of battleships in the fleet. However, in the first couple of years of the war, battleships were not used much in the Pacific. Why? Because they were gas hogs (actually they burned a very thick fuel called Naval Fuel Oil). The admirals had only so much NFO available which to operate their fleet, and a limited number of tankers available to transport it to the ships, so they decided to give priority to the carriers, which were much more effective in the ship-to-ship warfare of the early years of WWII, such as the Battle of Midway. It was a tough choice. Battleships might have lost their prima dona role in the fleet to the carriers, but when it came time to land on the beaches, the Marines very much liked having the big guns of the battleships around to pound enemy emplacements. There would be a time and place for the battleships, just not right then. The point is that these were resource-constrained decisions the admirals had to make. They would like to have had unlimited fuel available, and been able to sail both carriers and battleships in their fleets, covering vast distances in short periods of time. But most of their fuel was coming by slow tankers from ports on the west coast of the US, and so the admirals needed to make fuel availability and fuel consumption a core part of their planning. More ships require more fuel. Faster sailing speeds consumes more fuel. Tradeoffs had to be made. Our version of that is depicted in the Five Year Forecast. If you've been a long time reader of this blog, you know that I write about the Five Year Forecast very often. It's not because I believe the Forecast, prepared by Treasurer Brian Wilson, is the most important document in the world, or because I believe financial matters trump everything else. It's because a school district than runs out of money is like a naval fleet that runs out of fuel: Dead in the water. The Navy didn't have an infinite supply of fuel in WWII (or now for that matter), and we don't have an infinite supply of money. The Five Year Forecast illustrates how fast we plan to burn fuel, and helps us determine when we need to be resupplied (ask for another operating levy). Barring some significant change in thinking, the current execution plan for 2020 shows us needing to be refueled sometime after 2014. For that to be true - for it not to be sooner - we have to limit our spending to the rate shown in the Forecast - about 1.3% growth per year. There also needs to be no further erosion of supply (eg further cutbacks of State funding). As implied by the name, the current Five Year Forecast paints one version of our fiscal future through FY2016. It shows the spending growth rate kicking up to a little more than 4% per year starting in FY2015. The main difference versus earlier years is the assumption made as to the cost of compensation and benefits. Those costs will be driven primarily by what programs and services we want to offer, how many people we employ in the district to deliver those programs and services, and the terms of the next collective bargaining agreements with the teachers' union and the support staff's union, which will need to be renegotiated by the end of 2013. Maybe our planned fuel consumption rate and our assumptions of the fuel resupply rate are accurate and in balance. I suspect they may not be. Both may need some adjustment, and the conversations won't be easy. We can't wait until 2013 to start having these conversations. 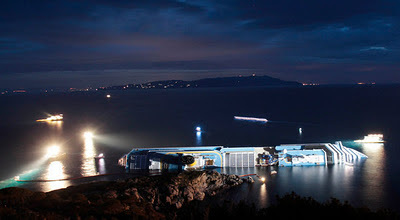 The captain of the Costa Concordia could have avoided this tragedy by doing better long-range planning, rather than assuming that he could make last-minute decisions if needed to avoid disaster. The first meeting of the School Board each calendar year is an organizational meeting, and ours was held last night. The purpose of the meeting is for the five of us to elect a President and Vice-President, and for the new President to make committee appointments for the other Board members. There is also a resolution authorizing the Superintendent and Treasurer to take various actions during the course of the year, essentially delegating authority for a specific set of things to those two executives. The Board also authorizes expenditures to sustain our memberships in a three organizations, the National School Boards Association, the Ohio School Boards Association, and the Metropolitan Education Council. "The cost of our NSBA membership and services last year was $13,000. It is not my contention that this is wasted money - only that I don’t believe it’s our highest priority. We’ve promised the people of Hilliard that we wouldn’t put another levy on the ballot before 2014, and to keep that promise, we have to be even more frugal with our spending. I believe our highest priority should be in classroom and school buildings. This $13,000 could purchase a dozen additional ELMO digital overhead projectors, or allow us to upgrade some of the well-used copiers in our buildings. We could buy more of the innovative student tracking software like we saw demonstrated by the math department at Davidson recently. It could buy new tires for a bunch of school buses, or patch up a few potholes in school parking lots. Or it could not be spent at all, and help us regain the 10% operating reserve which is our policy. No spending cut is without impact, and this is a relatively small amount of money in comparison to a $160 million budget. But I believe this sends the right message to the community and to the employees of the school district - that the Board is willing to make cuts in its own budget as well." Other Board members expressed their opinions in regard to the value our district receives from our NSBA membership, primarily in two areas: a) the importance of continuing professional development for Board members, both for the benefit of the members and to set an example for the professional team; and, b) the value of the national and state lobbying efforts made by NSBA on behalf of its members. I don't disagree, but think there are more impactful ways to spend the taxpayers' money. My motion was defeated 1-4, with me casting the one "yea" vote. The main resolution then passed 5-0.